All afficianados of science fiction are familiar with warp drives, wormholes, transporter beams and other exotic methods. They permit the scripting of a science fiction screenplay without the complexities of relativity and as a way around the light speed barrier. These ideas are not completely without some connection to physics, but the connection is very long and probably thin to the point of being nonexistent. Yet if a warp drive could be developed a spacecraft could travel to another star much more swiftly. It might be possible to travel to another star and return with a week, and if there are faster than light communications (subspace channel of Star Trek), instantaneous communications might be possible as well. Here some exotic forms of propulsion are examined. The least speculative exotic propulsion system is due to the frame dragging of a black hole. The black hole described in chapter 9 is a static nonrotating black hole. However, since black holes form from the collapse of a stellar core in general black holes are rotating. The result is that points of space near the black hole are pulled around with the rotation [11.1]. In general relativity space is the dynamical field of evolution, where it can morph and change with time. A comparison with the rotation of a fluid near a rotating mass is a fair analogue. All rotating masses will drag space around it. However, for a black hole there is a region near the black hole called the ergosphere, with an outer boundary given by the Schwarzschild radius, where a mass is pulled around inexorably by this effect. This ergo-sphere is a region outside the event horizon where a rocket with an arbitrary amount of thrust is unable to prevent its being pulled around with the rotation. This is the Kerr solution to the Einstein field equations, due to Roy Kerr. The rocket could in principle escape this region with enough thrust, but it is not able to prevent its being pulled around with the rotation. If this rocket were to then drop a bottom stage towards the black hole the upper part will then acquire a kinetic energy greater than the mass-energy dropped. The spacecraft could then escape the black hole with a highly rel-ativistic velocity. In this case the rocket has absorbed some of the angular momentum of the black hole and energy associated with its rotation. Fig. 11.1. The Kerr solution for the black hole. The contour lines reflect the frame dragging of geodesics in the direction of the rotation. This "exotic" propulsion system is based on well established physics of black holes. It is certainly an "in principle" propulsion system. However, the closest black hole is hundreds of light years away. So as a practical propulsion system this is not likely, that is unless an unknown black hole is near the solar system or some of the other exotic propulsion systems to be discussed gets the spacecraft to a black hole. Gravity fields also have tidal effects, which in the context of general relativity are the Weyl curvatures. This force along a mass of extension d are seen to be on the order of F ~ 2 GMd/r3. At the event horizon 2GM/r = c2. For a stellar mass black hole of 4-15 times the mass of the sun this tidal force would rip apart any mass larger than a meter in extent before reaching the ergosphere. This means that for any spacecraft larger than a meter a huge black hole is required, such as the black hole at the Milky Way center, where at the Schwarzschild radius F - dc6/(2GM)3 is less. This is thousands of light years away and obviously difficult to reach. Remember, we are mostly focusing on low gamma spacecraft designed to travel < 50ly. Reaching the Milky Way black hole would require a very high gamma rocket for the crew to reach it within a reasonable time. This would have little relevance for the rest of us on Earth, for it would still take many thousands of years on the Earth frame before a spacecraft would reach the galactic center. So really exotic propulsion requires that the fabric of space or spacetime be deformed in some manner to create a shortcut around the light barrier. The dream is that space might be appropriately distorted so that a spacecraft can bypass most of space or violate the speed of light limit. The first of these is the worm hole. The wormhole is essentially two Schwarzschild solutions glued together at their respective r = 2GM/c2 horizons. This is the Einstein-Rosen bridge that forms a wormhole [11.2]. This forms a bridge or throat between two regions of spacetime. These two regions are connected to each other, so that entering the boundary of one of these regions permits one to exit from an equivalent boundary to some other region. This can happen no matter how remote these two regions are. It is likely that spacetime on a small region near the Planck scale is filled with tiny wormholes that compose a spacetime quantum "foam" . If these exist in the quantum vacuum state it would then outwardly appear possible to excite the vacuum with enough energy to cause one to materialize, even possibly to grow it to a large scale with enough energy. While this might seem to be the case, the issue of quantum gravity may well make this impossible. The wormhole usable for star travel would be an intra-universe worm-hole. Here the two openings exist in the same spacetime. In general wormholes may indeed connect different cosmologies, sometimes called an inter-wormhole. There are similar wormholes that connect D-branes in su-perstring theory as well. In this case the metric is Euclideanized, where t2 ^ -t2, and the metric is transformed to a standard Euclidean distance in four dimensions. Such a wormhole is called a Euclidean wormhole instead of the Lorentzian wormhole. Figure 11.2 illustrates a wormhole, or Schwarzchild throat. The football space inside is a white hole, forbidden by thermodynamics, or a DeSitter cosmology. In the latter case a virtual wormhole in the vacuum might be the seed for a cosmology. The image on the right illustrates how the wormhole may connect up different regions of spacetime. Fig. 11.2. 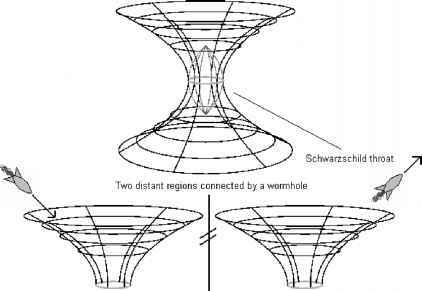 The structure of a wormhole and how it connects distant regions of spacetime. A strange feature of wormholes is that if one opening of the wormhole is Lorentz boosted to a velocity outward and then brought back the same way it is possible to traverse this wormhole and travel backwards in time. This relies upon the twin paradox problem in special relativity. A twin leaves Earth at a highly relativistic velocity and returns at a high velocity. The total proper time for this twin is less than the coordinate time of the twin who remains on Earth. The same will obtain for clocks near the openings of the wormholes. Once the two clocks have the same time and are separated by a light-like interval, or null line, the region of space in the future of this situation permit closed time-like curves that weave through the wormholes. 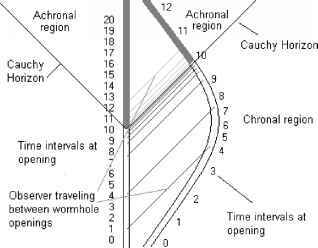 The light-like separation between the simultaneous clocks defines a Cauchy horizon that separates the time travelling region, called a non-chronal region, from the prior region that is strictly chronal. Hence a traveller who enters a wormhole, returns to the opening she entered and then plunges in again and does this repeatedly, winding through the wormhole endlessly, becomes a time traveller who can only travel backwards in time in the non-chronal region to the future of the Cauchy horizon. The winding loops pile up towards the Cauchy horizon. A traveller who does the same in the past of the Cauchy horizon will also be on a geodesic that piles up towards the Cauchy horizon. This is illustrated in Figure 11.3. Consider a light pulse that travels through the wormhole openings and then travels to the boosted opening through the region separating them. For light that winds this way through the worm hole in the region past to the Cauchy horizon this light will wind through an infinite number times that pile up near the Cauchy horizon. Similarly light winding through the wormhole in the region future to the Cauchy horizon will pile up towards the Cauchy horizon. This results in a singularity on the Cauchy horizon, where an observer approaching the Cauchy horizon will be hit with a huge pulse of energy that diverges on this horizon. This results in a singularity not cloaked by an event horizon. This is cause for some concern. This means as the wormhole is transformed to a time machine that the energy of vacuum modes and fluctuations winding through the wormhole will grow enormously, potentially disrupting the wormhole before the appearance of the Cauchy horizon and the nonchronal region. This naked singularity would undoubtedly have quantum consequences. An unproven statement called the cosmic censorship hypothesis states that such a naked singularity must not exist. Fig. 11.3. The conversion of a wormhole into a time machine. Wormhole solutions also violate something called the averaged weak energy condition. This is a statement that the momentum-energy tensor term T00 must be greater than or equal to zero. This negative energy term is required to divert infalling geodesics or particle paths to elsewhere, such as through a wormhole, instead of focusing them further within a black hole. This energy condition, along with the strong and dominant energy conditions, are imposed on solutions to the Einstein field equations to avoid queer solutions, such as the Godel universe that has recurrent time-like curves. The time machine aspects of the wormhole reflect this violation. Classical gravitation or general relativity permit these violations. Where these violations get into trouble is with quantum mechanics, or quantum field theory. The "stuff" in the momentum-energy tensor are ultimately quantum mechanical, or are quantum fields. If these energy conditions are violated this means that the quantum states of the field are not properly bounded. This results in all types of havoc, where the spacetime will exhibit massive fluctuations. A further problem is the quantum interest conjecture, which states with some measure of reasonableness, that if one attempts to generate a negative T00 somewhere that this results in a larger T00 elsewhere that overcome the negative T00. Hence if a wormhole could be produced from the vacuum state it may take the equivalent of mass-energy contained in many galaxies. So it appears that this solution might not be realistic. In the end a complete quantum theory of gravity will likely be required to resolve this issue. Negative energy and T00 < 0 are permitted in a limited manner with the Casimir effect. The quantum vacuum is filled with virtual quanta, such as photons that pop in and out of a region of space by quantum fluctuations predicted by the Heisenberg uncertainty principle. Two parallel conducting plates will constrain the virtual photons between them to have an integer number of half wavelengths, just as a wave on a guitar string has a specific sets of vibrations and a characteristic note. Because the set of all possible virtual photons outside the plates may have all possible frequencies the vacuum energy between the plates is less. This effect may be measured as a pressure exerted on the plates. So in a limited setting a negative energy, or relative energy, may exist. This appears to give a physical meaning to the vacuum energy, sometimes called the zero point energy. Some people think incorrectly that this is an energy source. The zero point energy is an artifact of quantization procedures, where in fact it might be considered as being ultimately a fiction. Generally this may be removed by certain procedures with no consequence to the physics of interest. Further, the vacuum energy is emerging as something similar to the aether in classical physics. In many ways the vacuum energy is becoming a source of confusion, where it is further known that for accelerated frames the vacuum energy is not separable from particle states. It may well be that a future theory of quantum gravity will change our ideas about the vacuum, where the vacuum energy may be shown to be an illusion. A wormhole solution has recently been found that does not violate these energy conditions. Yet, just as with any wormhole there is this problem of the singularity on the Cauchy horizon. The wormhole does not have any observational data for its existence, unlike the black hole. A wormhole has certain optical signatures with nearby light that characterize them as distinct from a black hole. Further, if what we think of as a black hole, one observed by its effects on mass-energy falling into it, should turn out to be a wormhole there should be the opposite face with matter and energy spewing from it. So far there have been no convincing arguments for naturally occurring wormholes. Nature usually manages to configure systems that are permitted to exist, such as naturally occurring masers in nebula. Masers are microwave analogues of the laser. So if wormholes can be produced in a laboratory they should exist naturally. While the wormhole has not been ruled out as a natural phenomenon, its status looks to be at best uncertain. Another science fiction device is the warp drive. Captain Kirk orders, "Warp factor seven. "It is true that the fabric of space may in principle be altered to generate a warp drive, at least within a classical setting of general relativity. However, just as with the wormhole this requires a negative T00 coefficient, which might render this solution impossible on quantum mechanical grounds. Yet it is interesting to look at this. Suppose that one had a spaceship with the ability to generate a matter or energy field that could compress a region of space in front of it. This ship is able to shove the points of space in a small region ahead of it into some smaller region. By doing this, just as a carpet is rippled up at some place the rest of the carpet behind this ripple is shoved forward. The ship is then sent along a free falling path towards this bump in the space. But in so doing this moves the bump further ahead. Further, because of this the distance that the ship appears to fall in its frame is shortened by this contraction factor. So if this region is compressed by a factor of 10 the apparent distance the craft falls is a tenth the distance travelled as measured by an external observer. However, to keep this going it is not possible to keep bunching up the rug forever. Slack has to give somewhere. So points behind the ship are stretched out. So this creates a bubble around the ship with points in front that are compressed together and points behind that are expanded apart. So there must be some sort of field that exist around the equatorial regions of this bubble, where the plane of this equator is perpendicular to the direction of motion, that interfaces between the compressed space region and the expanded space region. It is in this region that one requires some type of field with negative T00 coefficients. This might doom this as a physical solution and render the warp drive as a permanent denizen of science fiction. where R is the radius of the warp bubble and a is a parameter that might be called the "warp factor". The metric coefficients may be used to compute the curvature coefficients and with the Einstein field equation the momentum-energy coefficients. This reveals that T00 < 0, which is clearly a potential problem. 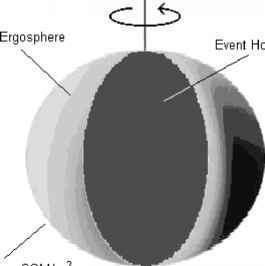 If negative energy is permitted and a warp bubble possible, then a warp bubble made large compared to the dimensions of the spacecraft will exhibit curvatures in the central region of the craft which are small. The forward squeezing of space and the leeward expansion means that the region inside the bubble is in a continual free fall. There would be no g-force on a spacecraft in this region. Thus locally the spacecraft is at rest with respect to its local frame. This leads to the curious cancellation of relativistic effects, so there is no Lorentz contraction of the spacecraft length nor is there any change in the observed clock rate. The craft is globally in the same frame as observers on Earth. The compression of space in front of the bubble and the expansion behind have the effect of cancelling out any relativistic effects. An observer on Earth will observe this warp bubble accelerate to velocities beyond the speed of light with no intruding or impeding effects of special relativity. Since the warp bubble is travelling faster than light it cannot be controlled. The walls of the bubble, where the large spacetime curvatures exist, are causally isolated from the interior. As a corollary there is no apparent way that this metric can be generated or engineered to begin with, nor is there any apparent way to turn the bubble off. That this spacecraft is continually falling through what is globally flat space may indicate something of the pathology with this solution. The Alcubierre warp drive has a "something for nothing" element to it, which is removed only if the averaged weak energy condition is restored. So far it appears that the warp drive requires this violation. Another exotic propulsion proposal is the Krasnikov tube [11.4]. A spacecraft travelling through space in the ordinary manner reconfigures the metric behind it so that time interval along a tube is radically reduced. Thus the craft, while having to travel the ordinary way to its destination is able to rapidly return. This at least can reduce a round trip to half the proper time on board the spacecraft. From the perspective of an observer on Earth the ship returns rather shortly after it left. This curious effect reverses the clock times measured by the Earth observer and the spacecraft observer. A single Krasnikov tube appears to create no pathologies, yet if there are two of them that a craft may loop through time travel, or a closed a timelike loop, is possible. 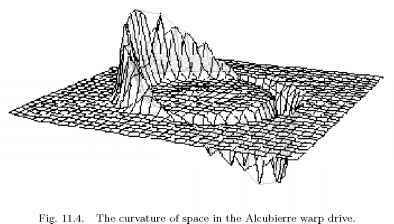 There is again the appearance of a Cauchy horizon with wild quantum fluctuations. These might destroy the Krasnikov tubes. Again this requires that there is some sort of metric engineering capability that is not well understood. It is likely that this approach shares the same theoretical status as the wormhole and warp drive. The term 8nG/c4 is the coupling constant between the physical matter-field and spacetime curvature. This is a very small quantity 2.07 x 10~48 sec2/ g-cm. This is one reason that gravity is a very weak force, where it takes the whole Earth to create the modest acceleration of 10 m/sec2, and why spacetime curvatures around the Earth and even the sun are quite modest. Thus, in order to engineer a metric one must exploit huge amounts of a matter-field to accomplish this. This coupling constant probably increases in size as the energy of interaction approaches the Planck energy 1019 GeV. This is a feature of renormalization in quantum field theory. Yet this requires technology which is able to control a still large amount of mass-energy that is at very high energy. It is clear that this is not technology which will be on the shelf any time in any foreseeable future, if ever. Quantum mechanics is not a topic of this book, but it does keep coming up here and there. For those who are aware of quantum mechanics and issues involving measurement and entanglement there is something that appears to be a faster than light effect. Two entangled particles that are separated by any distance are correlated instantaneously. For instance two spin particles with a charge in an entangled state, where one particle is subjected to a magnetic field so that it precesses, the other particle, even if very far removed from the magnetic field, will precess also. Similarly if the spin of one particle is measured the second may be instantaneously measured to have the opposite spin. This conjures up ideas that there is some sort of subquantal communication between the two particles. However, John Bell wrote down an equality that would exist if this were the case. Quantum mechanics without any subquantal communication violates this equality. Experimental tests have consistently demonstrated a violation of this equality. It can be said very safely that quantum states in an entanglement separated by any distance do not involve any faster than light communication. So various schemes advanced by people, often not deeply educated in quantum physics, of quantum field effect propulsion systems and the rest represent bogus physics. Faster than light travel is the holy grail of science fiction and those who envision humanity as a star-faring species in the future. Yet, our current understanding of possible approaches is at best uncertain. There are essentially three approaches for faster than light travel. The first is to ignore special relativity, the second is to abandon causality, and the final choice is to abandon a strong connection between local and global rules of relativity. The poor man's approach is to ignore special relativity. "It's wrong is all," codifies this approach. The problem here is that special relativity is battle tested. It is so well established that it is not tested so much as it is used. High energy interactions all rely upon the veracity of special relativity. Yet some will persist in their refutation of relativity. Some might cite the problems with reconciling general relativity and quantum mechanics as a reason. Yet this argument is spurious. A relativity refusnick is not dissimilar from a creationist who refuse to accept biological evolution as the proper scientific theory for the relatedness of species. One can only make the case for relativity, or evolution in such related debates, to people in denial in order to convince others listening to the argument. There is a point of no return where such people can't be convinced. The second approach is to violate causality. This is the case if particles could be converted to tachyons, which are theoretical particles that always travel faster than light. However, tachyons are fields used in superstring theories as something which removes difficulties from the theory by their disappearance. In effect in the early universe they "flew away" to leave the more sane physics behind. Tachyon travel would mean that in one frame a tachyon in motion travels from start to finish, and in another frame it travels from finish to start. Indeed, the Alcubierre warp bubble on the scale of a subatomic particle with some mass carried along with it is essentially a tachyon. Tachyon travel is highly unlikely. In the above case with wormholes and the Krasnikov tubes there is a nonchronal region that can exist under the right conditions. This results in closed timelike curves and time travel. Thus an event that sets in place a series of events may be later effected by this chain that loops back in time. So one could go back in time to kill your self before you started off on a time travel loop. This means physics is illogical. Attempts have been made to show timelike loops do not exhibit these effects, but the arguments are to my sense complicated and "strained." The wormhole, warp drive and Krasnikov tube separates the local laws of relativity from the global ones. For an observer in the bubble things locally are an inertial frame with all the appropriate properties upheld by relativity. For the distant exterior observer this bubble is a matter-field propagating faster than light. This disconnect between local and global laws of physics is troubling to some physicists. If this were the case it would suggest that we might never be able to deduce much about the universe by using the local laws of physics. Another approach is to say that the speed of light may vary under special circumstances. Spacetime appears to have an absolute cut-off in scale at the Planck length Lp = 1.6 x 10~33 cm, but where this is the same in all reference frames. Joao Magueijo, Lee Smolin and Giovanni Amelino-Camelia have advanced a modification of special relativity, where near this scale in size, or equivalently near the Planck energy Ep = 1019 GeV, the speed of light is variable [11.5]. This theory means that physics of spacetime on a very small scale exhibits departures from spacetime physics on a larger scale. This theory is possible and still considered to be tentatively viable. Yet it is tough to know how this could be applied to get a spacecraft to velocities greater than the speed of light. This survey of exotic propulsion concepts is meant to illustrate the difficulty in their possibility. As seen above it will be a formidable task to construct low gamma spacecraft to travel to nearby stars. Exotic propulsion concepts are vastly more difficult, and further may be impossible by quantum gravity. It is evident that exotic methods of propulsion can't be seriously considered for the foreseeable future. Low gamma spacecraft exploration of the immediate interstellar neighborhood is speculative enough.